I’ve spoken to a few groups recently about the importance of journaling not only as a means to organizing thoughts, but as a family treasure. Several years ago, my sister-in-law passed away. One of the most cherished things she left behind was her journal. We all enjoyed flipping through the pages, seeing her handwriting and getting inside her head. It’s also like having a conversation with her. 1. Relax. It’s just a notebook and a pen. 2. Don’t over spend. It’s not because of the leather bound beauty of a $50.00 journal that it will be treasured. It’s all to do with the words within. 3. Relax. I sense your shoulders tensing. 4. 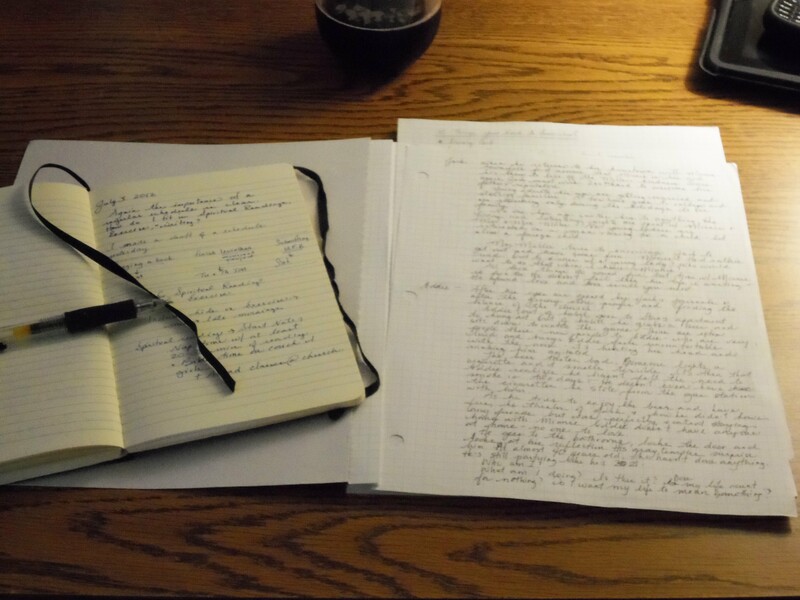 Writing in a journal takes three things: Pen, Paper, and Commitment. 5. Keep the journal visible. You will be more likely to commit to writing if you see it. 6. Set a time each day (10 minutes is enough) to write. 7. You don’t have to be a writer to write in a journal. Begin with a prayer to be honest and just write how you talk. Don’t worry about spelling or grammar. It’s the story, the memory and the lesson that are important. What do you write about, you ask? 1. What’s the earliest memory you have? 3. What did your bedroom look like when you were 16? 4. Who was your best friend in second grade? In high school? 5. What did you want to be when you grew up? Did that happen? 7. What did your parents think of your spouse the first time they met? 8. What was/is your favorite holiday tradition? 9. Did you have any pets growing up? If you have pictures of them, add it to your journal. 10. Looking back over your life, what was your best day? Can’t pick one? Write about them all over the next few days. 11. A little negative, but important: what was your worst day? 12. Did you play a musical instrument? If not, what did you want to learn to play? 13. What are the lyrics to your favorite song? 16. Wedding day? When, where, what you wore…add a picture. 17. The first funeral you ever attended…who was it? 18. Share an embarrassing moment. 19. Write about a valuable lesson you learned the hard way. 20. What books have you read that you think other should read? 22. What stories do you wish you had from your parents? Write that version of your own life. Years ago, I met a mom who had five sons. Instead of spending the evening in front of the TV, she, with the help of her family, recorded the day’s events in a journal. I thought that was a good idea. I’ll admit, even as a writer, I never made that a daily event and oh! how I regret that. It’s not too late. Start writing now. Added 4/26/13: The response to this blog hop has been, well, extremely under-whelming. I’m reposting in hopes that you’ve been taking this time to write and edit. Why a Blog Hop? Because it helps us all find new readers, to share our writing, to discover new writers. Join in and have fun! I hope to hear from you all soon! In anticipation of the release of my new book, Unforgettable Roads, coming soon from Martin Sisters Publishing, I’m hosting a photo/essay contest & Blog Hop. This is not to be confused with an essay told through photographs, but one photograph paired with one essay. The theme? You guessed it. ROADS. Photo and essays will be judged by bloggers – so this is where you come in. I will post all the entries. Followers (mine and yours) can vote for their favorite. All entries should be to me by May 1st, 2013. The Contest will match the release date of Unforgettable Roads – that date will be announced soon. – As you tour the roads, taking in the breathtaking scenery and reading about the journey of others, you’ll discover new writers, new ideas, and new connections. – Any networking Indie Authors can do to help each other is valuable. – Traffic to your blog will increase. – Free books. What’s to lose? There is no obligation to purchase anything. Of course, I hope you do 🙂 I will include a link to preview and/or purchase Unforgettable Roads in paperback, Kindle, Nook, or any eReader. If you are a writer, public speaker, photographer or anyone looking to build a platform (a base of readers and followers), this is a great event to help you with that. In terms of writing, the publishing world is transforming from one dominated by a few big publishing houses to a beehive of Independent and Small Publishing houses. The need to ‘get your name out there’ falls on your shoulders. Participating in Blog Hops is an effective (and fun!) way to do that. I will share this will all my followers and on all my social networking plugs. You and every other participant can – and should – do the same. Your writing will reach hundreds of new readers. If they like what the read, they might follow your blog. Nope. I only ask that the person who takes the picture also writes the essay. It is necessary that all entrants have a blog or a website on which to post their essay and photo. That page will be the link you send to me to connect to the Blog Hop. A Blog Hop is just like it sounds – readers can ‘hop’ from blog to blog, reading posts related to a similar topic. It’s a great tools to share book releases, discuss current events, or compare writing styles and voices. You said no extreme violence. What if the road I’ve been on recenlty was overseas in the war? By all means, share your story! Our veterans are a great treasure to this country. I look forward to reading your essay and seeing where you’ve been. Just keep in mind that I have many young followers/readers of this blog. The recommended amount for a blog post is between 300 – 700 words. Nothing too long or too short. Going along with the statement, “A picture is worth a 1,000 words” let’s keep it under 1,000. If you want to really crank this up to improve your writing, after you finish your first draft, try to trim the word count by half. Every word in excellent writing packs a punch. Knock your readers out with a highly concentrated essay. 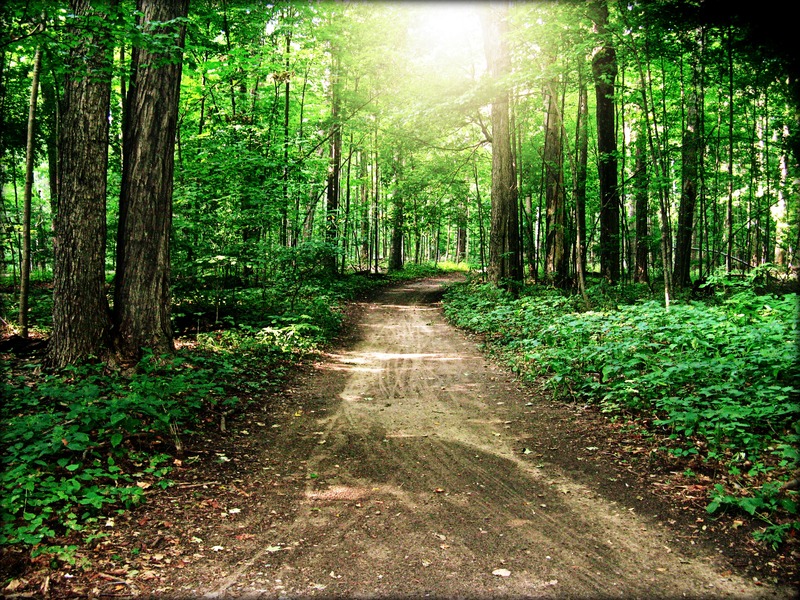 What is Unforgettable Roads about? When I visit schools, the students always ask where I find ideas for stories. The answer is complicated. I don’t find stories in one place or by doing one thing. Sometimes stories find me. Many blog posts end with an ‘About this Writer’ summary. I read one recently that punched me in the gut. Without stating names, this blogger lives in London and travels the world collecting stories. 2. Wishing. The thought of traveling the world to collect stories sounds dreamy. I would love to see what story awaits in Morocco or Spain or on the coast of New Zealand. 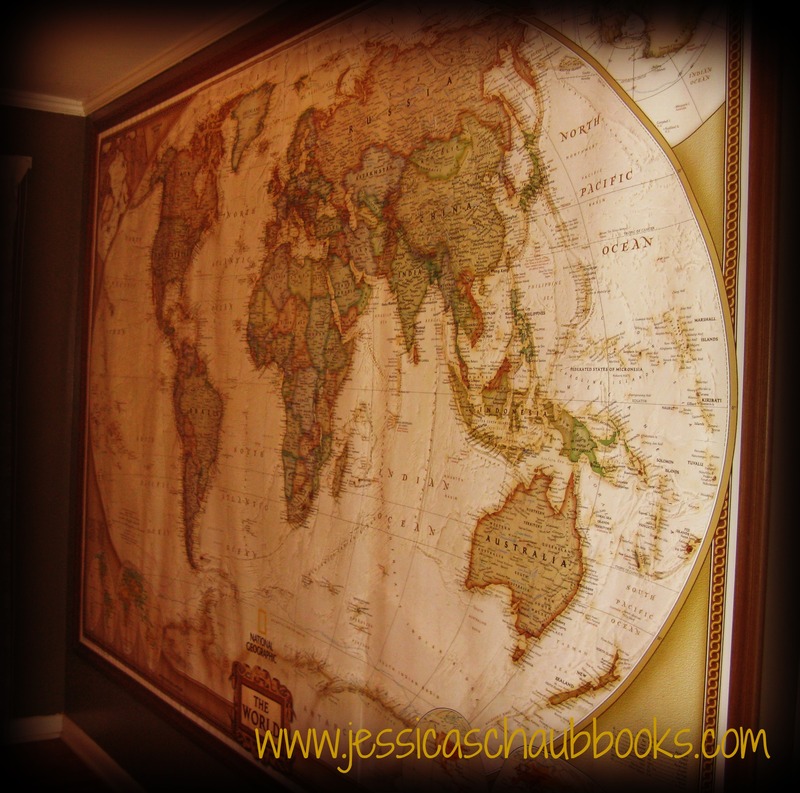 Instead of traveling the world, I wallpapered my dining room wall with a National Geographic map. My children, the daughters of a writer, think it would be great if we could just touch the map and magically go to that spot. I think there’s a story there. 3. Listening. I live in Michigan. I most recently traveled to Northern Indiana (an hour and a half drive). Next month I will go north 3.5 hours to do a school visit. I will collect stories along the way, mostly because I will travel with my four kids. My two-year-old son is a never-ending source of comedic fodder. I have several short stories for children that I wrote for my own children simply because they asked me a question that I answered with a story. That’s the case for Frog’s Winter Walk, a picture book coming out later this year. My daughter asked me where frogs lived in the winter. When I told her they hibernate, she was sad for them. “They’ll never see a beautiful snowy day.” Presto! A story was born. 4. Hoping. Other times, writing becomes a means to find the good in a bad situation. Unforgettable Roads is my effort to make something beautiful from Alzheimer’s. 5. Inspiring. Gateways is the result of a dream I had when I was nine years old that found it’s voice when I felt compelled to write a positive story for young adults in response to an aethiest’s effort to convince all young adults that God was dead. Stories can emerge from childhood memories, from snippets of overheard conversation, from dreams, music, and vacations. If you are a writer are looking for ideas, keep your eyes open and listen to the world. Ask, ‘What if…?’ and test the boundaries. Keep a notebook handy. Tuck a digital recorder in your pocket to take notes when you’re driving. Surround yourself with books, readers, good music. Turn off the TV, avoid Netflix and WRITE! What Will You Knock off Your Bucket List in 2013? Bucket List. Kind of depressing when I think about it; a list of things to do before I die. The image I have is one of an older generation rushing around, trying to tick off adventures and experiences before the big dirt nap. Which lead to me to think about lives and how we live. The key word being LIVE. How would the idea of a bucket list change if it was called a LIFE LIST? The items on the list would no longer be checked off before one dies, but experienced as one lives. What if, instead of creating a list of things to do, we kept a list of things must do, but do them with a joyful heart? The bucket-list-turned-life-list becomes an exercise in optimism. I’m anxious to try this because I’m a stay-at-home mom, blessed with four children, and encouraged by a husband who completely supports my desire to home school these little ones. My life is not a movie-worthy adventure. We don’t vacation in exotic places; in fact the farthest we’ve been from home on vacation was a five hour drive away when we camped for a week. However, if I could find the joy in the mundane I would be a better mother, a better wife, and a better friend. This year I’m changing my bucket list to the Life List, taking the challenges of parenthood, of home schooling, of writing, and flipping the negative thoughts on its head. Bucket List: Retire as a millionaire. Life List: Grocery shopping trips will become adventures as I shop for an entire month with four kids in tow and stay under budget – putting the money I save in our retirement account. Bucket List: Tame a wild animal and perform with it at a Circus. Life List: Train a toddler to be still during Mass. Bucket List: Become a Psychologist and create a new treatment for behavior disorders. Life List: Become a parent and train your children to respect authority. Life List: Watch your daughter drive away in your car on her sixteenth birthday. Bucket List: Visit every state capital. Life List: Visit your city’s Soup Kitchen on Thanksgiving Day (better yet, once a month) and serve a meal. Bucket List: Have picture taken with (insert favorite celebrity here). Life List: Become a child’s celebrity by becoming a reliable mentor. Bucket List: Write a book. Life List: Write a book. Hey, whatdoyaknow? Sometimes Bucket Lists and Life Lists line up! I recently wrote a novel based on this idea of a life list. 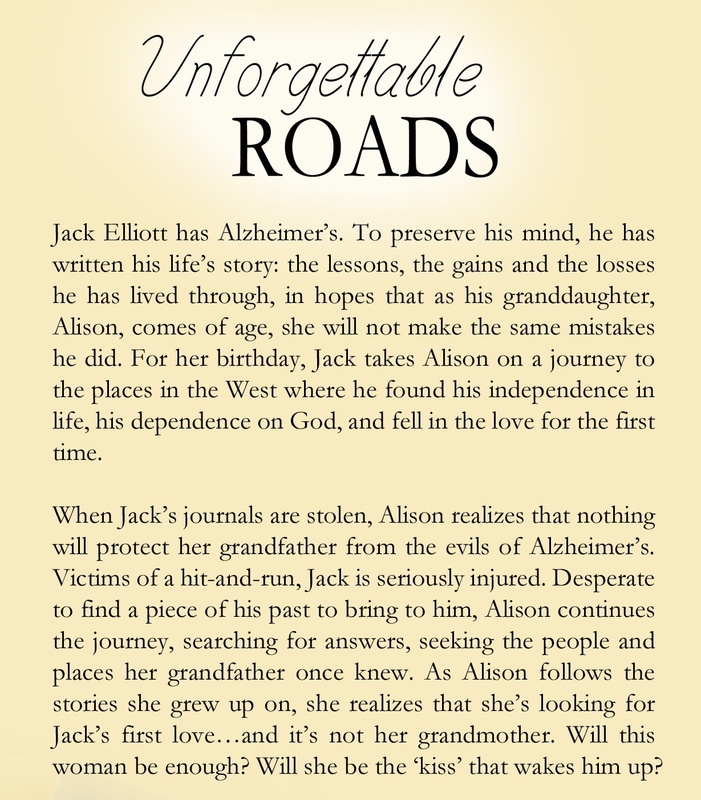 Here’s the back cover blurb: Jack Elliott has Alzheimer’s. To preserve his mind, he has written his life’s story: his westward journey and discoveries. When Jack’s journals are stolen, his granddaughter, Alison, realizes that nothing will protect her grandfather from the evils of Alzheimer’s. Victims of a hit-and-run, Jack is seriously injured. Desperate to find a piece of his past to bring to him, Alison continues the journey, searching for answers, seeking the people and places her grandfather once knew. As Alison follows the stories she grew up on, she realizes discovers her grandfather’s darkest secret. To sample the first few chapters of Unforgettable Roads here. 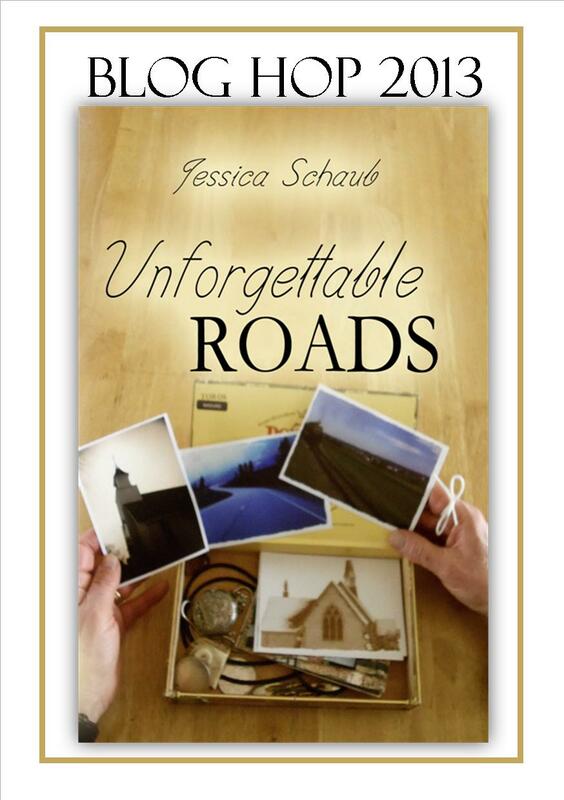 Unforgettable Roads has been offered a contract from Martin Sisters Publishing and should be released mid-2013. 1. I’m going to figure out how to use Twitter to reach readers. 2. I’m working towards completing 3 manuscripts that have been in the works for some time now and really need to be finished. 3. And then the editing, revisions, and submissions of those 3 manuscripts. 4. I’m going to read more books written by Independent authors and write reviews for them. 5. The blogging experiences is coming together for me and I love it. It’s more of a community than I expected. To this, I hope to work at my blog, connecting with other writers and readers to network, compile information about writing, research, publishing, and seeking publication. The police station is tidy but dust bunnies lurk in corners affirming only a clean surface. It smells funny too, like sweat and coffee and stale sugar. A young woman whose desk is in front of an open window obviously doesn’t smell like this room either; every now and then a wisp of her fruity perfume wanders over to me. It wasn’t been a long drive from the hospital to the station, but the officer said it was necessary for me to do the line-up. Trey stayed at the hospital, so at least Graypay wasn’t alone; not that he knew where he was or what had happened. I wasn’t even sure I knew the answer to that; we had traveled so far so quickly that it was impossible to remember what state we were in; North Dakota or Montana. Maybe it didn’t really matter. I was here now, in this station, because I had seen his face. It was only for a few seconds, but I could still see the depth of his blue eyes, and the long crease across his forehead, and the way his face glared with surprise when he looked at me. And then he left us there, confused and bleeding. “There’s just a bit of paper work to fill out while we wait,” the officer slid a clipboard across his desk. The morning was perfect. I woke to the smell of bacon and eggs, found a new fuzzy robe on the end of the bed, and a card that had been slipped under the door. My seventeenth birthday was off to a good start. The kitchen sizzled with excitement. As I stepped onto the tile floor, Mom, Dad and Graypay broke into a boisterous chorus of “Happy Birthday”. I couldn’t pronounce ‘grandpa’ when I was two-years old and ‘Graypay’ stuck. Mom poured my first cup of coffee, sweetened with milk, vanilla, and sugar. For years I woke to the smell of coffee. The rich aroma was delicious. Despite all my requests for a sip, I was denied, told that when I was an adult, I would join the ranks of the caffeine addicts. Until then, it was water, milk, or juice. All the years waiting were not in vain. Although I imagined the taste to be different, richer and less bitter, I drank it all. The warmth of adulthood spread through my arms and legs and I sighed, feeling very pleased. Seventeen. I know what you’re thinking. Seventeen is not the legal age for an adult. Eighteen is. But my parents married when they were seventeen. They started their own business after seventeen months of marriage. I was born seventeen months after they moved into this apartment. And yes, I was born on the seventeenth of May. Sadly, there is no seventeenth month of the year – that would round it all off quite nicely. Luckily, they didn’t go so far as to name me Seventeen or some equally horrible name. Alison suits me just fine. My reaction at this was…well, I’m not proud of it. I’ve been raised to respond to things calmly. But Graypay was handing me one of my dreams and it was, without a doubt, the best birthday present I have ever received – or ever will receive. But still, I pride myself on being unlike the other girls, all giggly and silly. What did I do that I’m so ashamed of? I jumped up and down, screaming and crying. I hugged Graypay and screamed some more. Next month I can cross the first thing off my list. 2. Put a penny on Abraham Lincoln’s knee. 3. Make a wish in Trevi Fountain in Rome, Italy. 5. Hike through a mountain pass. 6. Follow the trail of Lewis and Clark. 7. Take my picture in front of a Redwood tree. 8. Be a missionary for at least a year in a third world country. 9. Ride a steamboat down the Mississippi. 10. Visit the pub that C.S. Lewis and J.R.R. 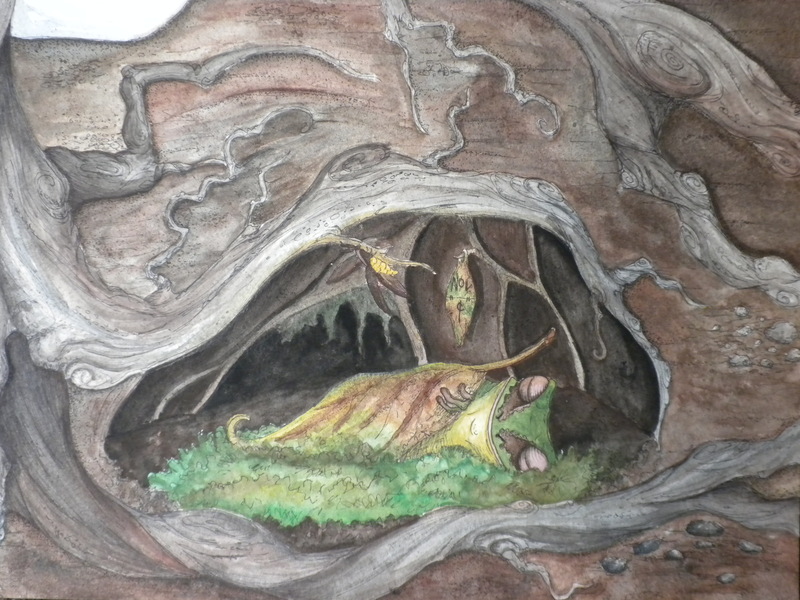 Tolkien frequented. 11. Write in my journal at least once a week. 12. Read every book on the banned list. 13. Be an ‘extra’ in a movie. 14. Go to Christmas Mass at the Vatican. 16. Have an article published in a magazine. 17. Drive across country. Not on highways, but back roads. And never on a toll road! 18. Work on a cruise ship. 19. Read from the Bible everyday. 20. Volunteer at a Soup Kitchen each Thanksgiving. 21. Take the tour through Anne Frank’s Secret Annex. 22. See the Great Wall of China. 23. Listen to what my body is telling me; my health is my choice. 24. Drink a mug of beer in a German pub. 25. Buy a bottle of olive oil in Italy. 26. Visit every state in the United States. 27. Learn the provinces of Canada. 28. Speak another language well enough to have a conversation and not be thought a fool. 31. Never eat ‘fast food’ again. 32. Go camping at least once a year. 33. Sponsor a child in another country. 34. See every Shakespeare play performed on stage. 35. Read the book before seeing the movie – in all cases. 36. If and when I meet a celebrity, I will not act like an idiot. 37. Solve a real mystery. 38. Drive on Highway 1. 40. If I do become a mother, I will do it right, making my children my first priority. 41. Drive Highway 2 from the Upper Peninsula of Michigan to the Pacific Ocean. 42. Buy books in hard cover. 43. Buy Christmas presents for children in foster care. 44. Rescue a dog from the Humane Society and give him or her life filled with love.